Whether it’s as reflective thermal insulation, a protective second skin against burning embers in a bushfire area or as a way to control condensation, CSR Bradford has a product solution to suit your application. Taping of the vertical overlap between roll joins is recommended to seal the side laps to prevent water spillage into the roof cavity and provide draught sealing. Sagging of the sarking to facilitate drainage to the gutter is required (but not more than 40mm). Sagging of sarking to avoid the sarking contacting the underside of the roof sheet (but not more than 40mm) is recommended to avoid temperature transfer from the roof sheet. All joins should be lapped 150mm and to achieve a vapour barrier, all joins, penetrations and discontinuities should be sealed. Creation of a continuous air space between the underside of the roof sheet and membrane is recommended to create a drying path when possible. 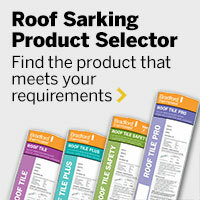 Please refer to the CSR Bradford installation guidance for sarking under metal roofs. Installation should always be in accordance with AS/NZS4200.2 as a minimum.